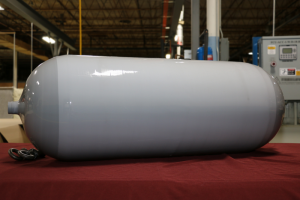 In addition to ground storage, WireTough Cylinders offers a range of DOT and NGV-2 approved cylinders for CNG storage in vehicles ranging in sizes from 57 ltr. to 260 ltr.. This line of cylinders can provide fuel storage from smaller vehicles like fork lifts, to the largest OTR tractor/trailers. WireTough’s vehicle cylinders provide greater volume and lower weight than type I cylinders. Our products offer also, a longer fatigue cycle life at a lower cost than type III and type IV alternatives, bringing exceptional strength and value to our customers.